No such thing as too many books, right? My husband and I are on opposite sides of that answer. but one of us is a reader, the other is not. You don't hear me complaining about too many Top Gear magazines filling the house. I am rather impatiently waiting the arrival of the built-in bookshelf for my studio space. So, for now, these books pile around me on the floor. Until the other day they were in my son's room/house dumping ground but I went on a spree and did up his room this past week. So now the books are piling up on the floor in my room. And that's not counting all my non-sewing related books (novels, bios, non-fiction, etc.) piling up on the floor of the bedroom. Also not counting the boxes of books stored away, hoping for a glimpse of the light. It's no lie, I've dreamt of a home library for years. Just like Lord Grantham with his red couches, impressive writing desk, and a tray of crystal and hard liquor. Or perhaps a slightly more modern version. A girl has to dream right? Because libraries are exactly what the architects of these 50s tract houses had in mind when designing boxes to inhabit. Any suggestions or pin boards on book displays/storage for a mid-century girl? Im with you! I once sold most of my books before a move because my parents were helping me move and I didnt want to here about it from my dad. In my current home I went to the local habitat restore, bought a couple brown faux wood with bits of old moldings for about $25. Painted everything white and had custom look bookcases. Now in my studio i went to ikea and bought billy bookcases for my stash. Most of those are from my sister's Pinterest page. She and her husband-to-be are extreme book lovers too! I'm a bit of a book junkie as well. I've always dreamt of a home library with one of those rolling ladders...sigh!! I've had to settle for several Billy bookcases from Ikea as well. At the IKEA near me, they have one room that is a two story library. I so love that look. I read all the time and my girls do too. Since the move to the apartment, most of my books are in the basement in boxes. 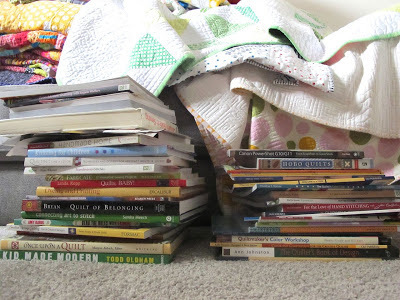 I pretty much sold most of my non-quilting books to half price books cause I knew there was no room for them. Hmmm maybe I will get some stuff from IKEA for the TV and lots of books. Hope all of yours find a home. my husband decided it was easier to buy me a kindle rather than another new bookcase - I read far too mcuh. 2 years later I have over 300 books (all read) on my kindle and the best thing is I can take it everywhere with me. I do, however, buy 'real' sewing books as the pictures are so much better! There is a business here in MSP that specializes in mid-century called Find Furnish. They used to do the Facebook/private sale thing and now have a store front. I think if you looked back through all their photos/sold items on their website/facebook page you'd perhaps get some ideas? And I'm sure you could find some MCM/retro glasses to outfit your library too! I'm a fellow book hound too. Quilting books up the wazoo, and novels, resource books, children's books. My home library is made up of Ikea book cases too. Someday (after a huge lotter win) I would like a library that has a rolling ladder going from bookcase to bookcase. You'll get all of yours corralled too. Good luck! You will have that space filled up in no time. I read, but just don't keep books around, especially with an eReader...no more clutter. That's just me! I'm so with you. I keep filling book cases with books. And buying more and more for my Littles.. My husband doesn't understand, he hates reading. You weren't inspired by the teetering piles of books by our windows? They're almost sculptural, no? Kidding... we're in bad need of attractive book storage, too. I'm anxious to see what you come up with.